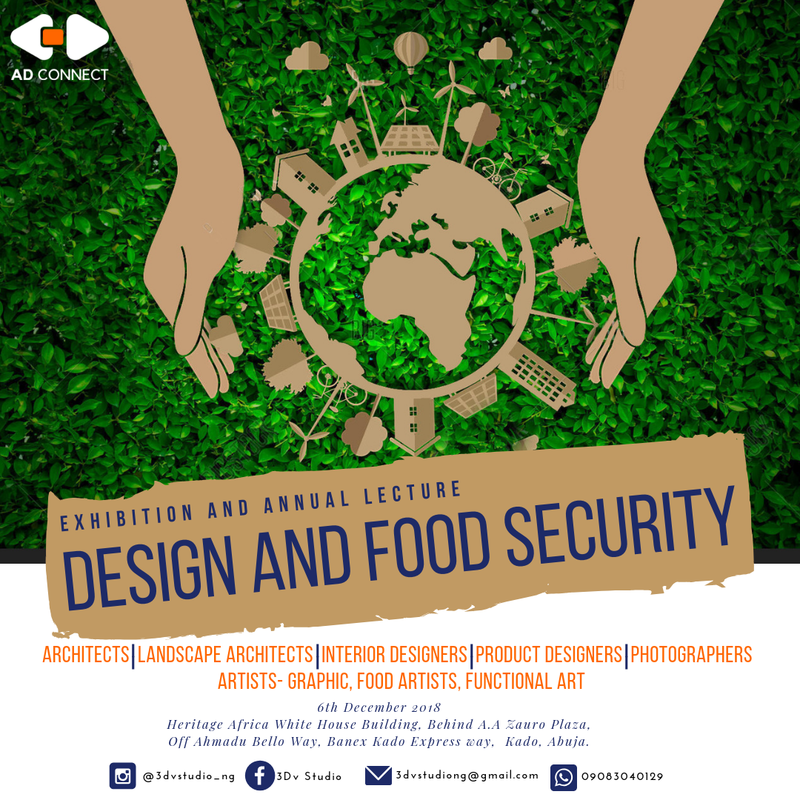 Register to attend AD CONNECT 2018 Exhibition and Annual Lecture on "Design and Food security"
AD connect 2018, an annual exhibition and lecture organised by Abuja-based 3DV Studio, is almost here! The forum was created for Architects and designers to connect and make a difference in the design community. Every year, an amazing line up of Speakers and Exhibitors (including Architects, Landscape Architects, Interior Designers, Artists, Photographers, Food Artists, Product Designers, etc) are gathered to share their insights, experiences and projects on the theme in focus. This year’s event will focus on “Design and food security” and would be taking place at Heritage Africa White House Building, beside A.A Zauro Plaza, Off Ahmadu Bello Way, Banex Kado Express Way, Kado, Abuja on the 6th of December, 2018, by 9 am. The event is divided into two categories, Architecture and Creative Art. The Architecture category will showcase designs of innovative, modern contemporary homes, as well as outdoor and interior spaces that depict the theme. The Creative Arts category will showcase designs that celebrate design, food and its importance (incorporating recycling and waste-to-resource systems) that also successfully depict this year’s theme. Entry to the event is free, but registration is mandatory as limited seats are available. It would be a great opportunity to learn and connect with other professionals. Click on the button below to register! The original dwellings of human beings was directly connected to our agriculture. Human built environment till this day is built in relation to survival: shelter, access to food and water, and the ability to store and protect these essentials. Selman (2010). A large suburb often faces the economic challenge in providing its growing community with convenient access to healthy food sources, resulting in food deserts or food mirages, the latter of which is when people who live near a grocery store can’t afford any nutritious food inside due to high levels of poverty. At this year’s AD Connect Annual Lecture and Exhibition we seek to raise awareness of the need to work as a community in shared urban spaces to help ensure equitable access to appropriate food sources. Secondly, we want to create a fundamental change in how we approach food security, by moving towards a more resilient design system that empowers people to meet their own food needs in the future. For example, in land-scarce countries, such as Singapore and Tokyo, where high-rise living is the norm, residents are becoming more aware of their food sources, finding satisfaction with harvesting their vegetables and aspiring to become urban farmers. Even without a backyard or reliable sunlight, urban farmers have successfully sought out under-utilized spaces on rooftops, sidewalks and atriums to create urban gardens and harvest food. As a result,these common spaces add vibrancy for residents, turning steel and concrete structures into healthy environments for our bodies. And so the timing cannot be better, for the built-environment professionals to rise up to this challenge and provide solutions. Interested in partnering or want to find out more about the event? Please Call 09083040129 or send an email to 3dvstudiong@gmail.com. TREBNET Directory VOL 1: The Guide to Sourcing Facilities Management services in Nigeria.